Once known only for its fishing business and scenic beaches, Sayulita now boasts a thriving community of local, Mexican restaurants and craftsman alongside trendsetting establishments. Surfing, paddle boarding, yoga, mountain biking and other outdoor activities helps make Sayulita an irresistible destination. 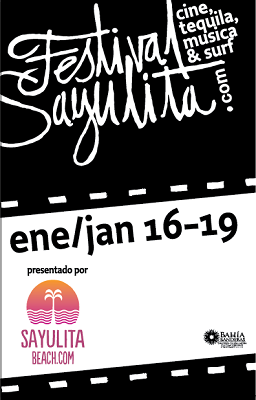 Festival Sayulita will highlight these many assets while spicing up the town with new and never-been-seen international films in the genres of action, short feature, documentary and animation. Tequila vendors will be offering tastings of locally made, specialty spirits and sharing some of their knowledge on growing and processing methods. Sayulita’s Main Beach will provide the central film venue and boast a 7 meter screen. Opening night will feature Bella Vita, directed by Jason Baffa. This touching film follows surfer Chris Del Moro on a pilgrimage back to his Italian homeland where he encounters not only surf, but family, tradition, and passion. On Saturday night, Mark Chistopher will be present at the beach venue to introduce his film A Band Called Death. As the name implies, this Band is a subject for this documentary about the first African-American punk band. Even if music is not your calling, this intriguing film will capture your attention with a fairy-tale journey of how brotherly love and devotion can lead to fame. The tequila portion of the event will be hosted by a small and select group of labels including Sausa, Tres Generaciones, El Capricho, and El Secreto. Each chosen for its distinct flavors, tequilas will be available for tasting during the Festival’s opening event on Thursday, during a Friday pairing dinner, a Saturday Master Tasting. In addition, some of the labels will be intermixed in film venues. All labels will be able to sell directly to Festival goers. This is an event not to miss! For complete details of the Festival, click Here.